No doubt you spent a lot of time and hard earned money researching and purchasing the perfect hot tub? Here at Clarion Spa we want to stress how imperative it is that you now protect your investment by cleaning and maintaining your hot tub on a regular basis. Your hot tub will love you for it and you will reap the benefits! how often you use your hot tub… obviously you want to enjoy your hot tub as much as possible, in fact if you don’t use your hot tub for prolonged periods of time it can cause problems e.g. the pump seal may dry up, crack and begin to leak. Always follow the manufacturer’s guidelines for appropriate use. the climate your hot tub is in… if your hot tub is outside in a particularly cold climate the operating system has to work much harder to maintain heat. where your hot tub is positioned… frequent debris from trees, dust, sand etc can create problems with the filtration system. water source hardness and impurities… when filling and topping up your hot tub it can create a build up of hard scale deposits within the operating system components. how often you clean the hot tub inside and out… unfortunately you do have to put in the time to get rid of the grime! Weekly water care, and quarterly purge/drain and refilling is essential to keep you and your hot tub free from harmful bacteria and deposits. how effective your cleaning products are… more products/processes certainly doesn’t mean a better clean, in fact it only highlights how ineffective the products are and creates more work and expense for you! The more products you use means that you are essentially just bathing in a chemical cocktail tub (ewgh)! the ingredients of your cleaning products… some chlorine and bromine chemicals corrode your hot tub’s operating system, discolour the shell, and can make the plastic parts brittle. You do NOT need harsh chemicals to achieve results. Do check the ingredients of your product, you’ll quickly realise that they have no ‘finesse’ in spite of their claims. buying ‘second hand’… as with anything you buy second hand you have no way of knowing how it has been cared for. Always purchase a pre-owned hot tub with caution, ask yourself why they want to sell it before you part with your money. the quality of the build… generally an American manufactured hot tub is a much higher quality than its Chinese counterpart. Clarion Spa’s recommended quality hot tub stockist is Project Pool, who currently offer free delivery and free installation (to the UK mainland). Okay so first things first, when you buy your new hot tub the manufacturer will have conducted a ‘Wet Test’ where your hot tub has been filled, switched on, checked for leaks and operating faults, drained, wrapped and finally shelved. This is great right? Well yes and no, you know it works but there may now be water residue in all the dips and troughs of the internal pipework, which creates the perfect breading ground for harmful bacteria. Your retailer/manufacturer should always advise you to initially ‘Purge and Drain’ before stepping foot into your hot tub. You can do this easily by filling your hot tub to the recommended level then using your purge and drain product before refilling. By popping Clarion Spa’s environmentally friendly EcoPurge Power Puck into the hot tub skimmer basket or floating dispenser both initially and then quarterly (every 3 months) you ensure the elimination of scale, rust and bio-film deposits on your hot tub pipe work and the mechanical parts of the operating system. Unlike most purge and drain products on the market you can rest assured that EcoPurge Power Puck is not just an inadequate degreaser, it is a 2-in-1 degreaser AND oxidisation designed for a thorough inside and out deeper clean treatment. There are no quick fixes to purge and drain maintenance in spite of what other products tell you. Your hot tub will love you for it and you will protect your investment for much longer. It’s no use putting the time and effort into a purge and drain to keep your hot tub’s operating system happy if you are then going to soak in dirty water. Lots of things can create problems: moisturiser/sun cream residue; hair products; little ones having an ‘accident’; natural shedding of skin and hair; debris from leaves; spilling your cocktail etc. All of these things will alter the pH of the water and will cause bacteria, algae, foam, and biofilm deposits (that disgusting pink slime) in your hot tub. By simply sprinkling the contents of one easy-rip Clarion Spa Active Silver Oxygen pouch into your hot tub water once a week you can ensure maximum water sanitation and avoid potential health problems for you and your family. That’s it! ONE product… NO measuring… NO spillages… NO pH test strips… NO pH balancers. Amongst other benefits, Clarion Spa’s Active Silver Oxygen incorporates balancing buffers to do that job for you for normal everyday use. Obviously if you do accidentally spill a drink etc in your hot tub you will negatively effect the pH balance and we would recommend that you test and balance the water accordingly until you use next week’s Active Silver Oxygen pouch. 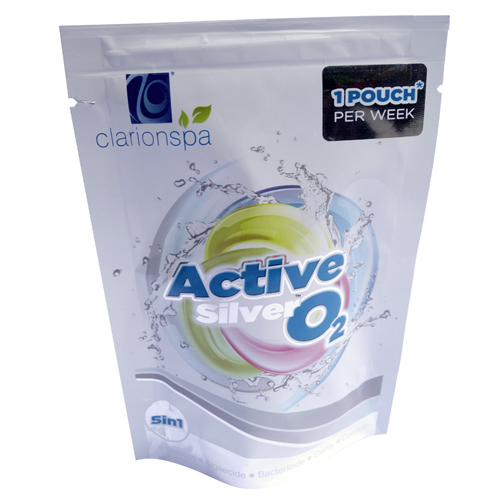 As the name suggests, Clarion Spa Active Silver Oxygen harnesses the effective gentle cleaning power of oxygen and silver. It does NOT contain chlorine, diclor, triclor or bromine, which can cause a variety of harmful effects for both you and your hot tub. Now you need to reduce your household water source hardness and it’s nitrogenous materials and impurities such as chlorine, fluoride and trace metals e.g. copper, iron, mercury and zinc. This will help to eliminate scale formation and prolong the lifespan of your hot tub operating system. By effortlessly attaching Clarion Spa’s Mineral Ball Filter to your garden hose with the free adapter when you refill and top up your hot tub water, you can combat this problem throughout the year. Clarion Spa’s Mineral Ball Filter uses environmentally friendly biodegradable ‘Activated Ceramic’ as it’s purifying media as opposed to un-environmentally friendly ‘Activated Carbon’. This activated ceramic media is penetrated with inorganic minerals. Not only is this beneficial for the continuous maintenance of safe and clear water in your spa or hot tub, but it also benefits you the bather. These active ingredients are absorbed into your body, re-energising you and replacing vitamins and minerals that your body loses whilst relaxing in warm water conditions. 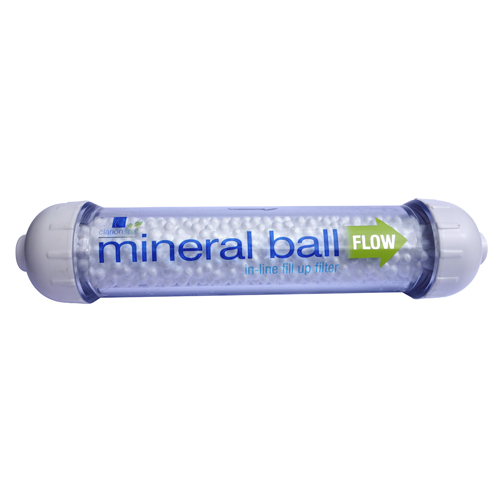 To ensure the long life of your Mineral Ball Filter, simply drain it fully and keep it refrigerated between uses. Remember to keep the cover off your hot tub as you re-fill with clean water and this will also stop nitrogen in the air being transferred into the filling water, as this is the main source of sustenance for bacteria. Three environmentally friendly, chlorine/bromine free products is all you need for effortless cleaning and hot tub maintenance. Clarion Spa can provide you with some of the most innovative hot tub chemicals on the market place today in order to make the most of your hot tub investment for years to come.